Richard Leach’s 7 Stars of Jazz has a style reminiscent of the Alex Welsh Band, which, from the mid 1950’s to the early 1980’s, was Britain’s foremost Chicago/Dixieland style jazz band. When asked, many people have said that the Roy Williams – John Barnes era of the Alex Welsh band is their favourite listening. Richard is no exception and the Classic Concert recorded in Dresden during 1971 remains his personal favourite. 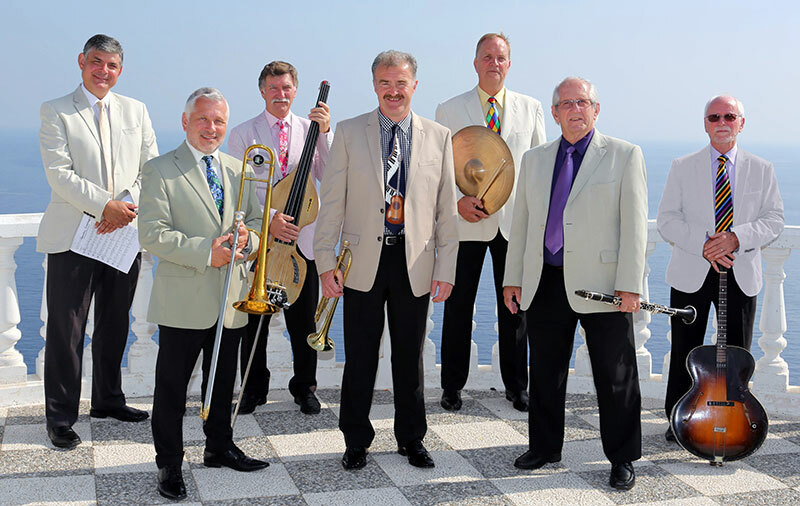 With the perfect eclectic mix of Chicago, Swing and Dixieland plus a hint of Vaudeville, the band doesn’t just play jazz it entertains the audience. It is impossible not to be swept along with the atmosphere. This then is the basis of Richard Leach’s 7 Stars of Jazz, not to be a direct ‘tribute’ band to Alex Welsh but a band that plays with a similar energy and skill plus the ability to entertain an audience with a variety of musical styles. John started playing the clarinet & saxophone in his early teens, and jointly with Mickey Cooke, formed the Blue Lotus Jazz Band, which went onto play at the Royal Albert Hall and the 100 Club. 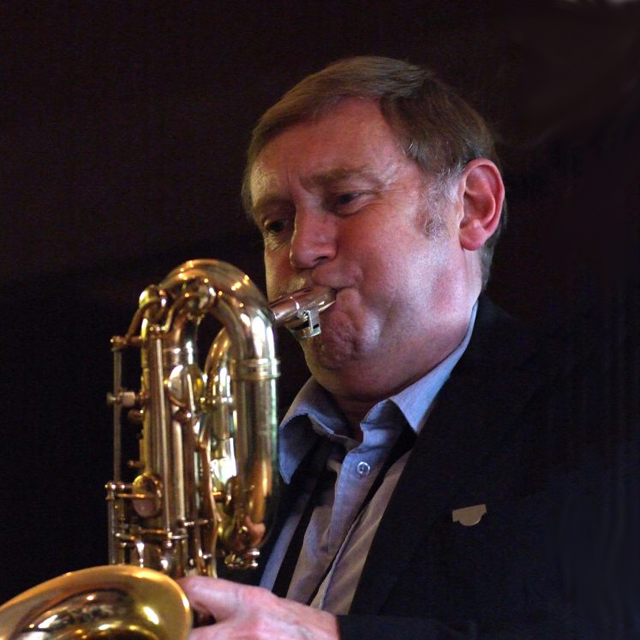 During the seventies and eighties he played with the Smoky City Jazz Band – the premier Manchester Band at the time, which toured many European Festivals. Since then he has worked for many years as a freelance professional musician, playing with some of the finest musicians from both sides of the Atlantic – Clark Terry, Benny Carter, Al Grey, Allan Vaché & Randy Sandke being just a few. His work has covered recordings for radio, television and film. Also jazz workshops and projects for education. Kevin started playing at an early age with brass bands in his native Cornwall. At 18 years old he enlisted in the armed forces and joined the band of the Queen’s Own Hussars (Royal Armoured Corps). Whilst in the army Kevin studied at the Royal Military School of Music for two years. Since leaving the armed forces Kevin has been working as a freelance musician gaining a wealth of experience playing alongside many of the jazz scene’s top names aswell as leading his own highly successful Jazz Giants which work extensively on the club and festival circuit throughout the UK and across mainland Europe. In 2009 it was Kevin’s inspired idea to collaborate with fellow trombonist Richard Leach in a new venture called Slide By Slide where the two trombones provide the focal point of an eclectic repertoire that shows that music doesn’t have to be boxed into any one particular style. He joined Richard Leach’s 7 Stars of Jazz at the beginning of 2018. Guitar/banjo player Jim Douglas was born in the village of Gifford near Edinburgh in May 1942. He showed an early talent for music when he took up violin at the age of seven and drums shortly after. The violin was soon discarded but he went on to feature in the local Boys’ Brigade Pipe band as lead drummer. It was at school however that he met and formed a jazz band with clarinettist /bagpiper Pete Kerr. It was his interest firstly in ‘Skiffle’ and later jazz that led to Jim acquiring a guitar and banjo at the age of fifteen. In May of 1961 Jim joined the ‘Clyde Valley Stompers’ just after his nineteenth Birthday. During this time the band had a successful hit with a jazz version of ‘Peter and the Wolf’. 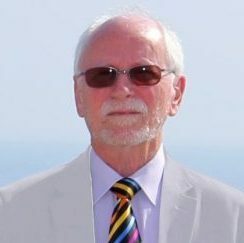 Financial discontent led to the whole band leaving and in 1963, after a period of re-establishment, Jim started playing on occasional gigs with The Alex Welsh Band. After officially joining he band in 1964 he was to remain with it almost to the end of its existence when Alex died in 1982. During this eighteen years or so The Alex Welsh Band became one of the most popular outfits in the British Isles and was asked to accompany many American Jazz Legend visitors to these shores. They included: Henry ‘Red’ Allen; Earl Hines; Wild Bill Davison; Bud Freeman; Ruby Braff and many more. Several historic recordings of these sessions have been found, digitally re-recorded and issued. In 1968 the Band was invited and appeared at the famous Newport Jazz Festival in Rhode Island. Shepherd, Pete Allen and John Petters to play with them in shows like ‘Lady Sings the Blues’, Let’s Do it, and outfits like the Great British Jazz Band, the ‘First Class Sounds’ and Ed Polcer’s Tribute to Eddie Condon on a tour in Germany. In 1993 Jim won the British Jazz Award on guitar. 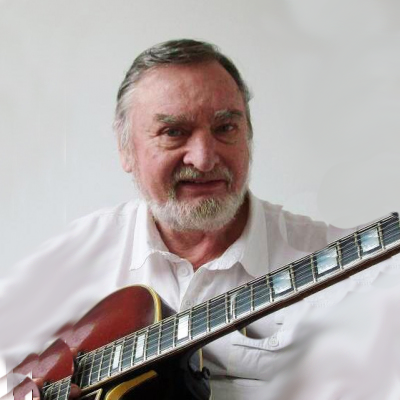 As well as being known as the most recorded jazz guitarist in Britain, Jim has written and self-published two semi-biographical books relating some of the more unforgettable, amusing and nostalgic memories of an event-packed life in Jazz. They are both available from Amazon.co.uk. 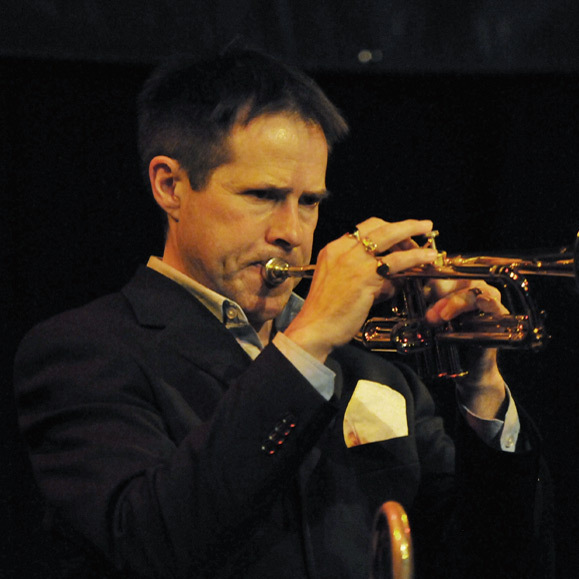 Ian Riley graduated from Leeds College of music after studying Jazz piano; trumpet and composition were second studies with a strong link to music technology. Work on board a cruise liner in the Mediterranean and then a long stint playing at Alton Towers both in Show bands and pop bands in small venues and to crowds of thirty five thousand people, Along side this came the delights of Pantomime at the Theatre Royal in Stoke on Trent where Ian Played keyboards and was then Musical director. The Moscow State Circus was the next venture with Ian acting both as musical director and arranger, this included work on Blue Peter Specials, the Big Breakfast and The Royal Variety Show. Work since has included a European tour with ‘Twentieth century musicals’, working on many amateur musicals and the wonderful delights of teaching the piano. Ian has been Musical Director for: – Linda Nolan, JimmyTarbuck, and Kenny Lynch. Big band music, Salsa, Blues, Soul and Jazz music have also played a large part in Ian’s musical life. Jazz has always been Ian’s favourite music to perform so he is especially delighted to have joined Richard Leach’s 7 Stars of Jazz. Ian Parry’s musical education began at school, where he studied violin. Later he taught himself guitar and played in skiffle bands and folk groups whilst adding banjo to his list of instruments. At University he first encountered Jazz music, that being the popular music there at the time. However there were many very good guitar players available but only a small number of bands. A friend then offered a lesson on a double bass, on the basis that the strings were tuned the same as the bottom four strings of a guitar…so that should be easy then! The very next evening Ian played his first gig on double bass, learning as he went. 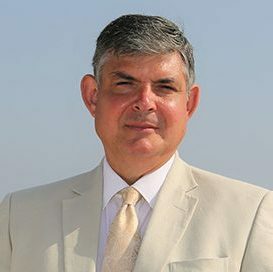 Ian has since played in many bands of differing styles, on bass, guitar and banjo, firstly in his ‘native’ Middlesex and more recently in his ‘adopted’ Midlands, where, incidently, he was born. Ian joined the 7 Stars of Jazz in August 2010 initially helping out on double bass. Graham Smith a Brummie by birth, started playing drums at the age of 14 in his father’s dance band until his early 20’s when he ceased playing to pursue a career in banking. Two decades later he bought his young son Russell, also now a very competent drummer, a drum kit and found himself responding to the need for a drummer with the Warwickshire based Pete Harris Jazz Band and borrowing his son’s kit! In 1993, together with his pianist father, he formed the popular Jazz Allsorts. Early retirement from the bank in 1999 gave Graham the opportunity to pursue his musical ambitions and to join The Antique Six Jazzband. He became a full member of The 7 Stars Of Jazz in early 2006. In pursuit of expanding his style and interest in jazz genres he also performs with Kevin Grenfell & Richard Leach Slide by Slide as well as deputising with an increasing number of bands around the country and performing with a growing list of jazz stars from home and abroad.